Every week, my farmer delivers fresh-picked tomatoes, peaches, herbs and as many squash as I can carry. Then, there's the okra situation. For the last month, my CSA box has included a big bag okra. "I hope you're not tired of okra," my farmer says. I vaguely smile. I'm not tired of okra -- I'm stumped by it. I love having a CSA. Every week, my farmer delivers fresh-picked tomatoes, peaches, herbs and as many squash as I can carry. But then, there's the okra situation. For the last month, my CSA box has included a big bag of okra. "I hope you're not tired of okra," my farmer says each week. I vaguely smile. I'm not tired of okra -- I'm stumped by it. Okra is like the cilantro of the vegetable world -- most people either love it or hate it, but so far I'm smack in the middle of the "indifferent" category. There's plenty not to like about okra -- it can get slimy, it has an odd flavor -- but I feel like I'm just missing something. As a transplant Southerner, I wouldn't turn away fried okra, but I don't get jazzed about it, either. Serve me some okra-laced gumbo, and I'll eat it, but I'll slurp down, not savor, the okra chunks. I want to know what else there is to love about this under-appreciated veg -- so I looked for inspiration. My first stop was the Homesick Texan, who also has a complicated relationship with okra. 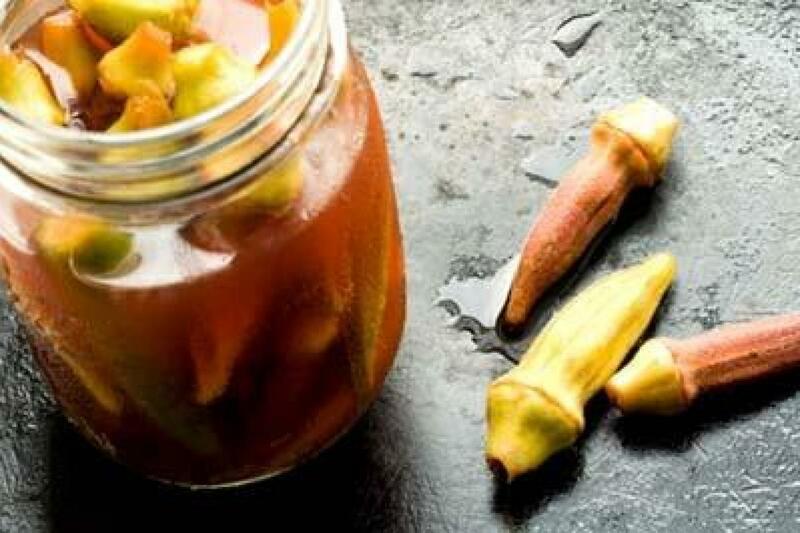 A former hater, these spicy okra pickles changed her mind. Could they change mine? 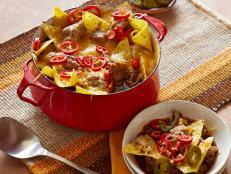 In the "okra: it's what's for dinner" category, Cooking Channel's own Roger Mooking has a (surprisingly) appealing idea: okra chili (and a whole episode all about okra!) 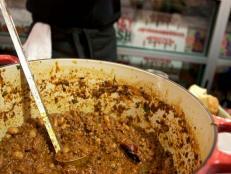 He mixes up his own spice mix, then throws in chili classics like red beans, beef, a bottle of beer and, of course, okra! 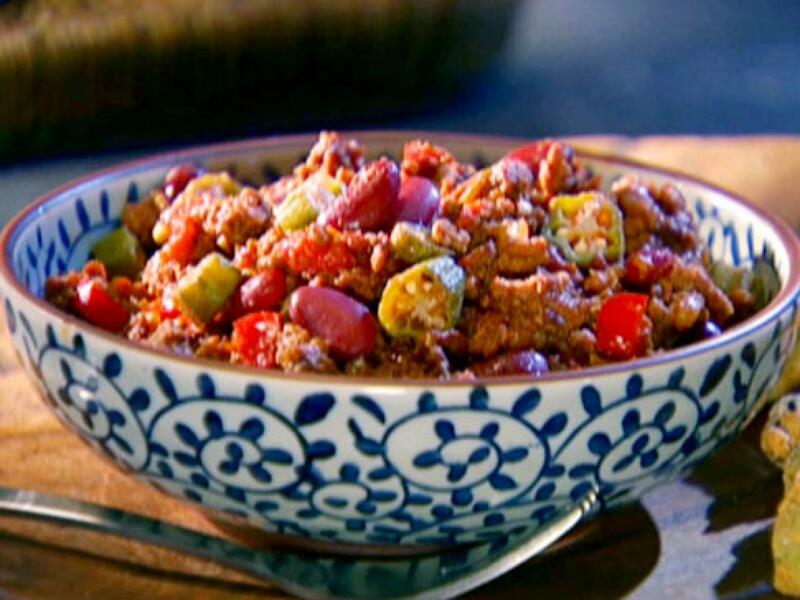 Okra chili with ground beef, red pepper, onion, diced tomatoes, and kidney beans. Over at the Souvlaki For the Soul, I found a simple, classic Greek recipe: braised okra (or "bamies," pronounced bum-yes in Greek). 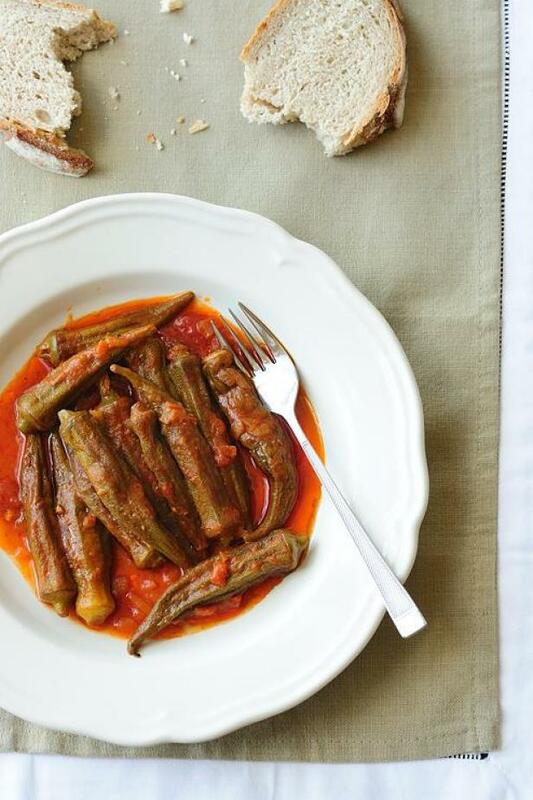 You quick-pickle the okra in red wine vinegar, cook with tomatoes, onion and olive oil, then sop up all the delicious sauce with crusty bread. Yum! 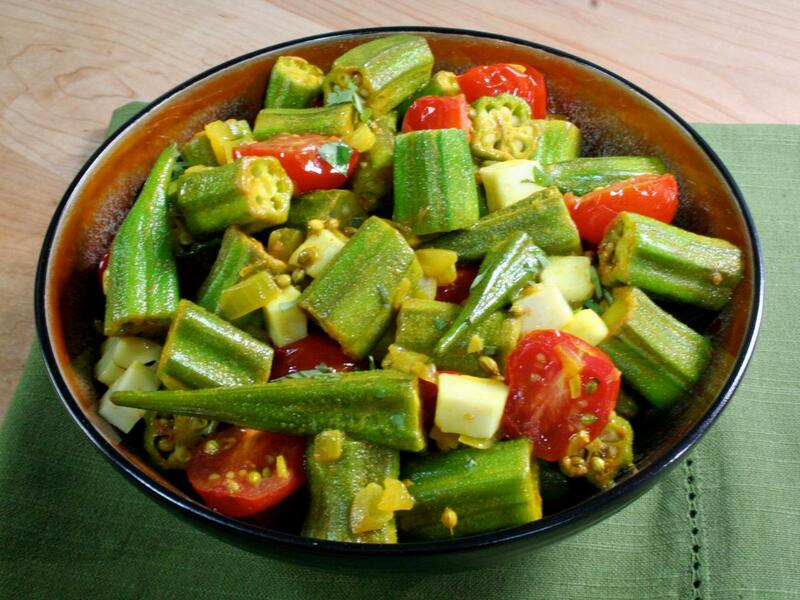 Cooking Channel's resident Spice Goddess, Bal Arneson, has a delicious-looking, Indian-inspired take on classic stewed okra. She sautes onion with coriander and turmeric, then adds cherry tomatoes, okra and fresh paneer (!) 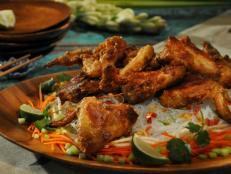 and cooks till just tender. Hmmm. Okra...yum? 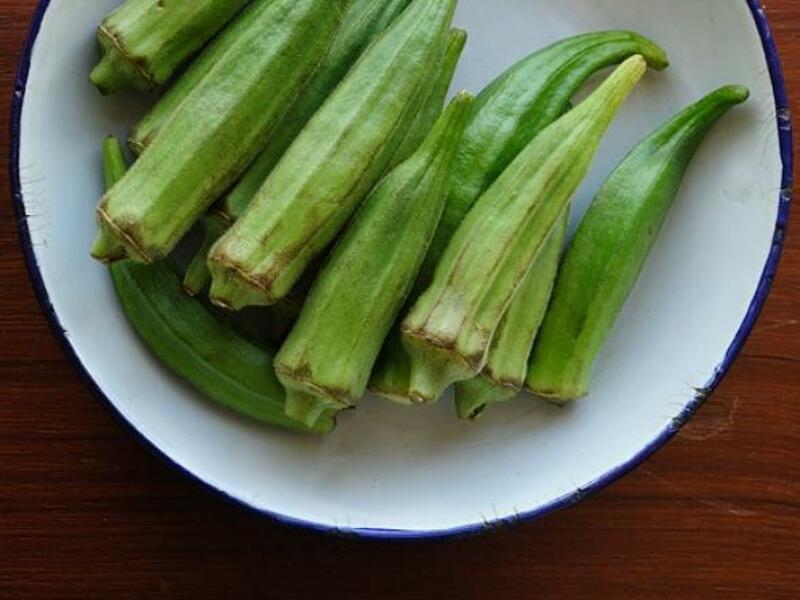 For the first time, I'm excited about, not dreading, the pile of okra in my fridge. Okra: do you love it or hate it? How do you cook it up? 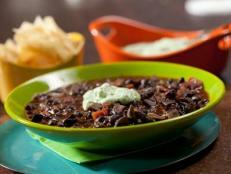 Get chili and chip recipes like nacho-topped chili, seafood chili in tortilla cups and Chorizo nachos on Cooking Channel.